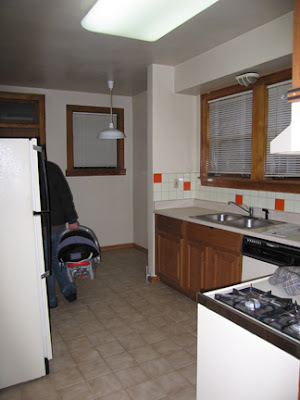 Design Dilemma: How Can I Make This Rental Kitchen More Attractive Without Renovating? More Ways to Waste Time reader Lisa writes: "I'm hoping you (or your lovely readers) might offer some guidance. This is the kitchen in the apartment I'll soon be moving into. I'm a renter, so major renovation is out. But I'm willing to paint, change the pendant fixture, and do anything else that can be un-done when it's time to give up the lease. My biggest concern is paint. There's a yucky fluorescent light -- how do I compensate for the greenish cast with paint color? Any other ideas to brighten up the room? I love cooking and I have to feel comfy and happy in my kitchen. Thanks!" Oh, the dreaded "landlord beige." Will somebody please explain to me why the people who own rentals think this will make their properties more attractive to prospective tenants? I don't get it. First, don't assume that the landlord won't let you make permanent improvements. He or she may not want to deal with them, but might be more than happy to allow you to. Hell, the landlord might even be willing to split the cost of minor remodeling with you, or let you deduct the price of materials from the rent as long as you provide free labor. And though you don't want to sink too much cash into a place that isn't your property -- it is your home, at least for the next couple of years, so it's worth fixing up a bit. There are lots of simple changes you can make that won't cost much, but that will have a big impact. I'm guessing that you can't paint the cabinets, baseboards, or wood trim, but it's still worth asking about. (Nick and I once had a landlord who let us paint our horrible, orange-y plywood kitchen cabinets a deep teal -- hey, it was the early '90s.) A bright, glossy white on the wood would work wonders to freshen up the space. Above is the kitchen at our last house, where we painted the (again, horrible, orange-y plywood) cabinets with Ralph Lauren's Polo Mallet White in semi-gloss. It made a huge difference. 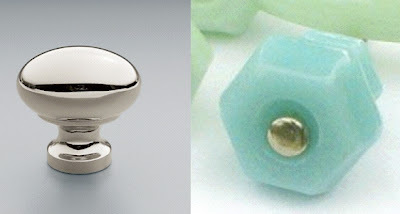 Then you can swap out the existing cabinet hardware for something crisp and clean, like the Ephram knobs above, $7 each from Restoration Hardware -- or for something sweetly vintage-y, like these colored milk-glass knobs, $3.50 apiece from eBay seller AuntiGin's. As for wall color, I'm partial to tart apple greens and snappy pale aquas in the kitchen, but if you can't paint out that stained wood, those colors might not work so well. If you must leave the cabinets and trim as is, my vote would be for a soft sage green on the walls, which will warm up the space and work nicely with the wood. 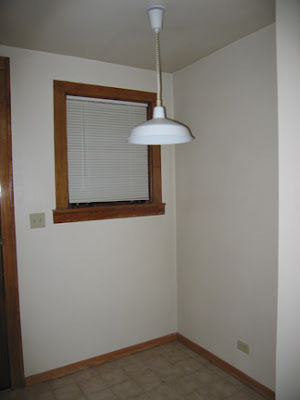 And while you're at it, just paint right over those almond-colored lightswitch and outlet covers. To soften the Arctic glare from the fluorescent fixture -- and to help camouflage its plain old unsightliness -- you could wrap it with warm-toned rice paper or even a semi-sheer fabric stuck on with double-sided tape. And be sure to replace those cold fluorescent tubes with ones from the warmer end of the spectrum. (Without fail, landlords will buy the cheapest and ugliest bulbs available, but there are some better choices out there these days.) 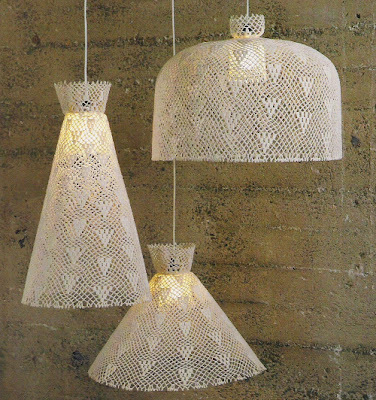 And while I don't mind the simple light fixture in the breakfast area so much, one of the crocheted pendants above, $224 from Rian Rae, would be lovely. 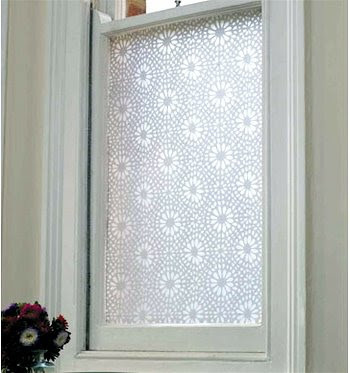 Next: Take down the metal mini-blinds (you can always put them back up when you move out). In their place, install some fresh and simple roman shades (available inexpensively in standard sizes from places like IKEA); colorful cafe curtains (buy tension rods, fabric, and heat-activated fabric tape, and you won't even have to sew or install hardware to hang them); or even pretty window film (which lets light in but maintains your privacy and blocks an uninspiring view), like Emma Jeffs' Moroccan Tile pattern above, $75 a roll from Pure Modern. 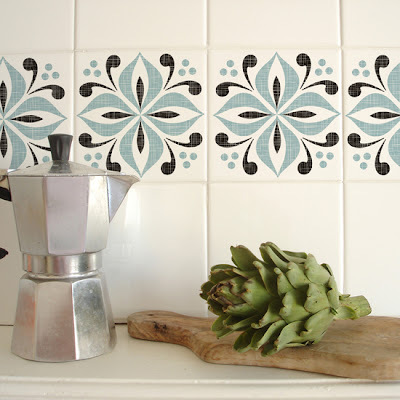 I think the orange tiles on the backsplash are kind of fun, but if they don't work with your new color scheme, cover them with these cool Tile Tattoos by Mibo, $16 for a set of six from 2Jane. The counters aren't too offensive, but a simple butcher-block countertop would be a nice improvement that won't cost much. It doesn't look like there's all that much counter space to begin with, and (with you landlord's blessing, of course) you could have new butcher block put in for a few hundred bucks. That's what we did in part of our old kitchen, at left above. Formica is another cheap option -- and there are actually some pretty cool laminate patterns available these days, as well as solids like crisp white or deep charcoal that are understated and reasonably attractive (for real!). And, oh -- those floors. I have a huge pet peeve about this sort of faux "Tuscan tumbled-stone" ceramic tile, which sells for about a buck a square at Home Depot. I'd happily take a sledgehammer to all of it if I could. But since you probably can't, I'd cover it. Ask your landlord if you can put down some stick-on vinyl tiles, which aren't too tough to pull back up when you move out and can be configured in fun patterns, like a checkerboard. 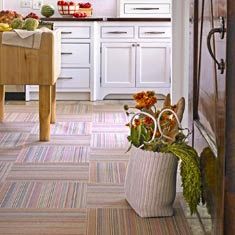 Carpet tiles are another option; FLOR makes some great ones in a variety of poppy colors. The beauty of those is that if you spill on one of them, you can simply pull it up and rinse or replace it. Even better: You can take the carpet tiles with you when you move on to your next place. At the very least, throw a couple of colorful area rugs over that frightening floor. 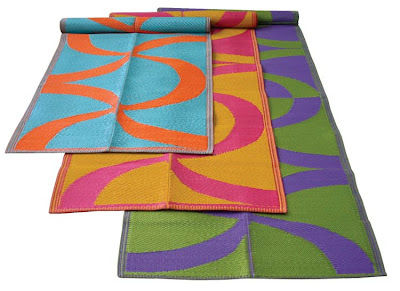 These plastic floor mats by Koko are just $36 each from 2Modern. They're bright, fun, and can be taken outside and rinsed off with a hose if you drop a casserole on them. Now for furniture: You need something compact and round for that breakfast corner. 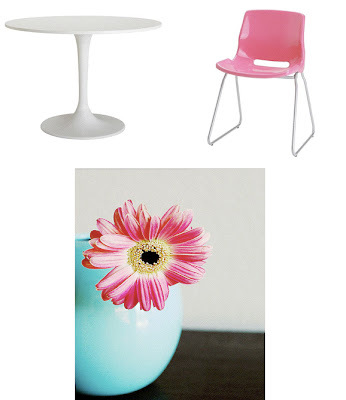 I'd get a white Docksta table, $149 from IKEA, and a set of colorful chairs (like IKEA's Snille chairs, $15 each), and then splurge on some happy supermarket Gerbera daisies for the table every week. Finally, pick up some cheerful table linens and tea towels (like Fractil, above, $8.50 from Tikoli), and hang some colorful prints or even a grouping of thrift-store plates on those bare walls. 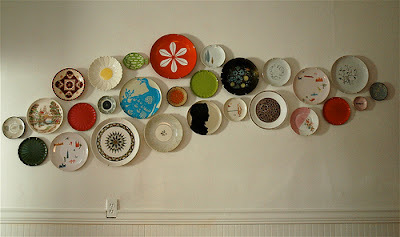 I love the collection below, for instance, from San Francisco artist Lisa Congdon's home. And then I think you'll have yourself a pretty stylin' kitchen -- even if it is a rental. Readers, what say you? Add a comment to share you own advice for fixing up Lisa's kitchen! Your ideas are fantastic. Forget the blogging... open your own interior design biz! On 2nd thought, keep blogging... I read you every day. Hi Leah, glad I found you via Holly's decor8. 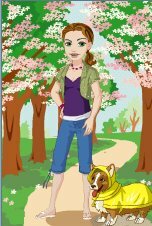 I have been coming by every week - thank you for your awesome blog ! May I suggest for this kitchen 3 things : 1. yellow 2. yellow 3. yellow -- Just my 2cts after more than 20 yrs in the interior design arena. And I completely agree about this loathesome/unexplicable "landlord beige". We had a rental house initially for 3 yrs (stayed almost 4 ), but 1st thing I did : I painted those sometimes too big rooms all by myself. And some rooms were a greenish shade, even worse. What did he do with my professional colours concept ? Paint over it, of course. Anyway, my experience and stance on green as a colour in rooms/homes : whatever we paint walls, the colour will reflect on our teint/complexion/faces. 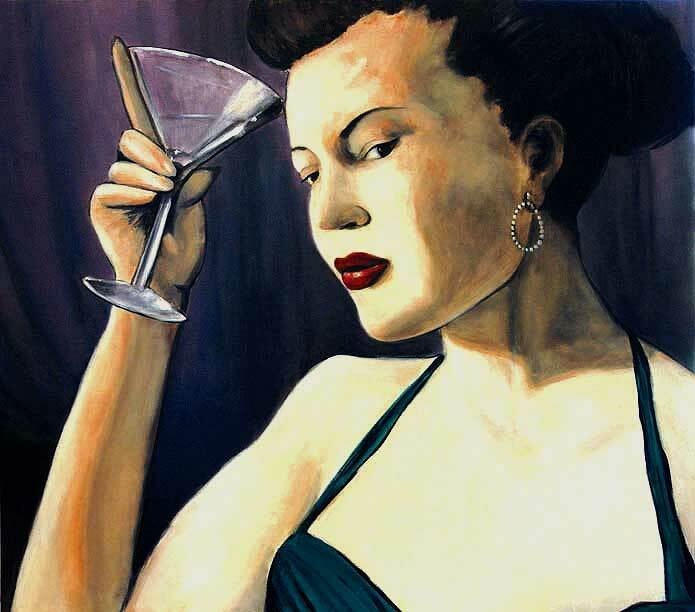 I have never and never will paint a room any shade of green, because it gives people's complexions what I call a "pre- or post-puke"
shine. Green is lovely where it belongs : outside, in nature's realm. Go with experience, not with trends, whoever propagates them. Thank you. Wow! Thank you so much for the feedback! 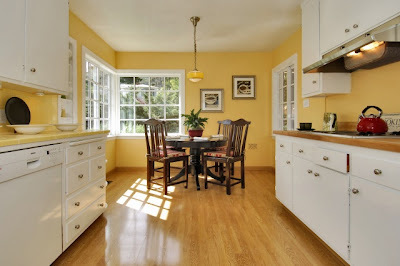 Funny, I had just been fantasizing about painting all of the cabinets white, they are old and cheap and it would be a big improvement, but not sure if the owners will go for it, they seem a little skeptical about my ideas for improvements. What can I say? I think you covered it! And you have some really gret sources here! (Love the tile tatoos for a quick fix! 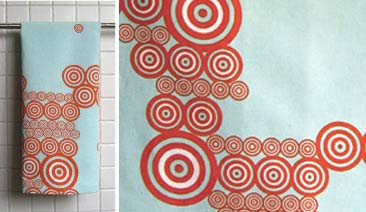 )And teh 2modern rugs - great! we have a light spring green on our bedroom walls and never have weird color issues...we do have a lot of natural light, so maybe that balances our skin tones out? hm. i never thought of that. i think all the posted recs are awesome, nothing left to say. I too had been thinking glossy white doors would help! Leah, I love your comments! I wish you could come help redecorate my kitchen. Is that a Schoolhouse Electric fixture in your previous kitchen? It all looks like something out of a magazine. I should note, though, that the dining set, the generic art, and some of the accessories (the, ahem, porcelain purse) weren't ours == they were part of the "staging" when the house was for sale. I'm definitely going to paint my kitchen cabinets white until I get the funds to remodel. Wow - why didn't I think of that? As for the plastic floor mats by Koko, I bought one in turquoise and red last year (can't remember whose recommendation I followed) and it's great. Spills and crumbs are easy to clean. And the bright colors will work nicely with the Pop Art-theme I plan to use for décor. nice work on this design dilemma, leah! i'm lucky to own my kitchen and it's bright wasabi green of course! but when i was renting i was told by one landlord after another, if i painted, i had to be prepared to paint it white again. personally i think it's worth it. and in my last apartment, the new tenants loved the bright yellow strié finish i had done, so i was off the hook when i moved. re the fluorescent lights- there are other bulbs available for that overhead fixture, in a variety of colors and "temperatures." it makes a big difference to use a color corrected "sunlight" bulb, in place of the cheap "cool white" bulbs most people have. i replaced all the bulbs in my studio, and it's a whole new world there. hey-his decemberist-I am looking at getting one of the koko floor mats but was wondering if they are really lightweight...in a way that they don't lay flat or stay put. Do you have any problems with yours? We have a Koko mat in a different pattern. It is very lightweight, so you need to put a rug mat underneath to hold it in place. Sticking it down at the corners with double-sided tape probably isn't a bad idea, either. 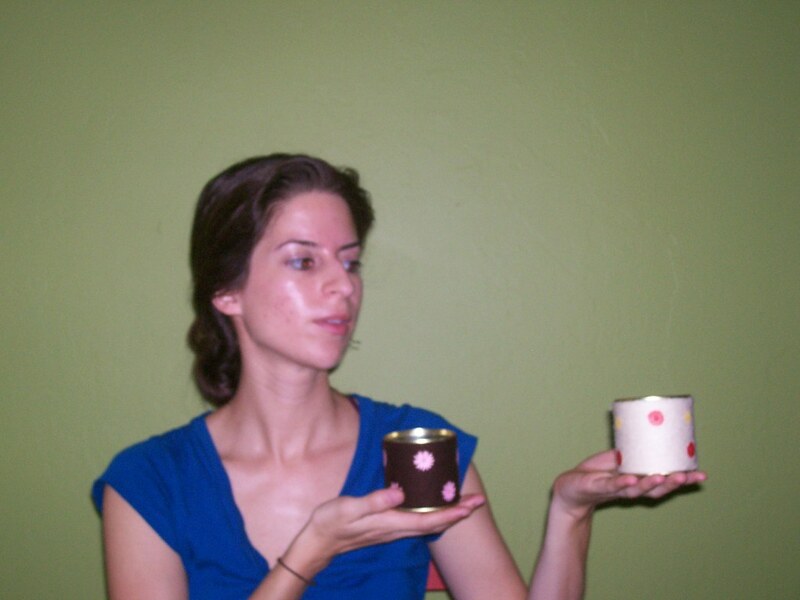 Lynne, great info on the light bulb options -- thanks so much! 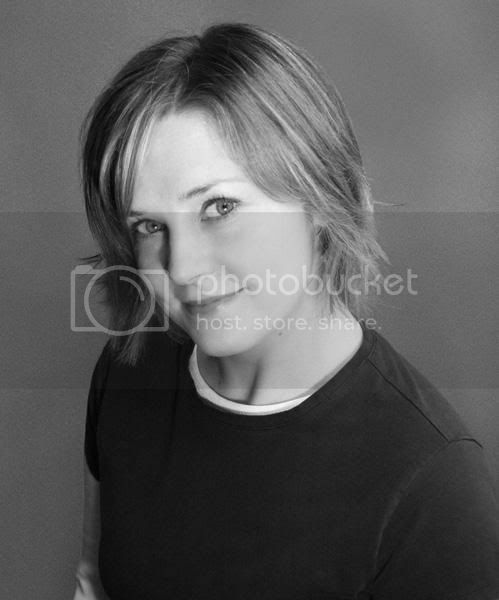 Lucia -- thanks a ton for your professional feedback on color. 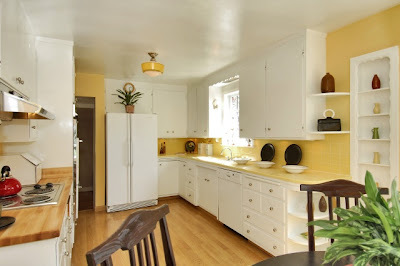 Yellow is always a lovely choice for a kitchen (we had it at our last place and loved it!). Our current kitchen is a soft, very pale green, and it feels crisp and fresh to me. We do get a lot of natural light in the kitchen, and the green is offset by lots and lots of white-painted cabinetry and woodwork, so I'm sure that helps. We also painted our laundry room a really zingy lime, with a turquoise Marmoleum floor, and think the result is bright and happy. It makes doing laundry not feel like such drudgery. Color is so subjective, and of course the specifics of your space, the amount of light it gets, etc. can really affect how a color looks. But I think that, in the right setting, green can be lovely. That's just my own opinion, though. I love the pictures you have included in your post. Those were great ideas for a kitchen. Good Luck! That was well-thought and redesigned. Very good tips offered on this post. Ikea is not a bad place for purchasing small items for kitchen decorations.